April 23 is William Shakespeare's birthday, and to celebrate this I'm joining the 'Blog for Shakespeare's Birthday Project' . I'm posting today about my latest project, "Storming Shakespeare". This will be my sixth Shakespeare-related book. The series began in 1998 with the publication of "Shakespeare's Flowers", the idea for which came to me while watching a production of The Herbal Bed by Peter Whelan, at the Malvern Festival Theatre. There was a scene where Susanna Hall (Shakespeare's elder daughter) was gathering herbs in the garden, and I had a 'light bulb' moment, thinking of all the herbal and floral references in Shakespeare's writings. It brought together two of my great enthusiasms, Shakespeare and flowers/herbs/plants, and I loved making that book. "Storming Shakespeare" is about Shakespeare's dramatic use of storms in his plays. I have had to trim my original thoughts to make it workable in a miniature book, as many of the plays are liberally sprinkled with stormy episodes. When you see them staged, the sheer physicality of the storm event is charged with excitement, noise and flashing lights, and it is quite difficult to convey the drama in an illustration. The plays I have chosen to specifically comment on and illustrate are Julius Caesar, King Lear, and The Tempest. 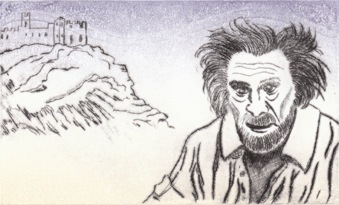 This last couple of weeks I've been working on one of the illustrations for the King Lear quotations. I've used the drypoint etching technique with monotype, and I will be adding some 'fireworks' with gold leaf. The head of Lear is loosely based on a photo of the Canadian actor Christopher Plummer in the role. It took me several attempts to convey Lear's (Plummer's) emotions -sadness, anger, bewilderment, frustation, fear, despair- and his frailty. This was the closest I could get. It's so rewarding to base a work on a Shakespeare text as invariably I learn a lot by examining the text in detail, and thinking more deeply about it than I might otherwise. There is always a rich variety and multiplicity of meaning to tease out. Happy Birthday, sweet Will! I'll post this image again when I've added the gold leaf 'fireworks'.